I would suggest that U152 (and L21) are clear relics of the secondary phase of the spread of the developed full package beaker culture from west-central Europe. I also feel that despite its welling up in Iberia, DF27 probably belongs to this phase too but its harder to prove this as DF27* has a weird distribution. I've found myself agreeing with you more than usually in the last day or two -- hope you keep at this line of thought about two "Beaker" phases separated by a good 500 years that don't look genetically very similar (and with R1b belonging to the later group, if any); and if that happened, perhaps the earlier group also didn't speak PIE (or some derivative thereof). And I might add that the distribution of DF27* gets a lot less weird if it doesn't have to originate in Iberia and spread to the east, along with a popular pattern in Portuguese pottery. Glad to hear it! However, I really wouldnt pretend to be certain on much. I can see advantages to that idea I proposed. The two types of beaker people/phases model is a very long held one and emerges in various guises from the early 20th century to very recent times. I cant think of anything that I have read in archaeological papers or any other genetic or linguistic aspect that undoes that model entirely. Which is a good starting point :0) but I am not committed to it. I am sort of torn between a lack of experts in Iberian archaeology proposing external origins for the pre-beaker copper age (other than the stuff in Harrison and Heyd) on the one hand but also the need to explain the establishment of copper working cultures on the other (I find independent invention in Iberia very unlikely). I can see arguements for either angle but I was actually surprised at some of the hints at a non-R1b non-IE aspect of the early west-east beaker complex when I compared distributions. I thought I was just playing Devil's Advocate when I had a look at it but was pretty surprised how well the two stage model seems to work. We will known soon enough with ancient DNA. ..you will not find much people in university supporting your idea, at least for what I know certainly not in Spain. Yes I was rather assuming that you were talking about Spanish academics. In fact I supposed that you were talking specifically about Basque academics. Strangely German, British, French, Irish and American academics are merrily publishing material that I cite in support. No, not Basques, but Spanish. BB in the Basque Country is too controversial to even being discussed, as it is clearly a foreign influence, and one that bring radical changes, it doesn´t fit the paleolithic continuty paradigm. But back to the BB origin, so you say that many scholars support the idea that the origin of BB in Portugal can be traced back to Yamnaya? Is that correct? just looking to clarify points. Sangmeister´s reflux theory, formulated in 1957. Under heavy attack by German and Dutch archaeologists, it has been held by Spanish archaeologists along all these years because simply it is the best explanation for the available archaeological evidence. I recall back in the 80s my professor, I. Barandiaran, at the University telling us student that no matter what the C-14 results of BB in Holland said, there were clearly 2 different BB people in Spain at different times. The Etruscan language is not Indo-European. In fact it does not belong to any living language family, though it resembles two other extinct languages: Raetic, testified by inscriptions in the Alps, and a language spoken on the island of Lemnos in the Aegean Sea. Studies of mtDNA in ancient Etruscans indicate an origin in Anatolia, but at what time? Could that resemblance date back to the Neolithic? Archaeology and DNA studies of Tuscan cattle breeds suggests not. The ancestors of the Etruscans seem to have arrived in Italy around 1200 BC. Herodotus reported that the Etruscans were from Lydia... The people they supplanted were Umbrians, as Herodotus tells us. Place-name evidence supports him. I haven't the faintest idea how many scholars have even thought about it. All I can say is that BB has been part of thinking about Indo-European spread, within the steppe homeland model, from the earliest days of its concept by Gimbutas. That means that Indo-Europeanists such as Mallory and Anthony assume that BB sprang from Yamnaya in some way, though the exact route might not be clear, or ideas on said route might differ. So there is nothing new about the BB-from-Yamnaya-somehow thinking. There has been a lot of shifting around and confusion about BB itself. What Harrison and Heyd did was piece together the Yamnaya package and its relationship to the BB package and showed the evolution from one to the other at Sion. That provided the solid link previously missing. At the conferences run by Koch and Cunliffe on the "Celtic from the West" idea, they have made it clear that they do not propose that PIE itself spread from Iberia. The PIE homeland debate is unchanged by their proposals. They start from the position that PIE or dialect of same came from the homeland somehow to Iberia. (Renfrew would like that to be in the Neolithic of course.) They are only concerned with the movement of Celtic, which they would like to argue spread from Iberia (with Bell Beaker), though they concede the alternative possibility (which I prefer) that Iberia simply remained a reservoir of an archaic form of Celtic, being on the periphery of its development. So I suppose you could colour them neutral on this issue. He assumed that they were Lydians, but Beeks has explained the confusion. They were most likely (non-IE) Anatolians who were pushed out by IE-speaking Lydians. ...telling us student that no matter what the C-14 results of BB in Holland said, there were clearly 2 different BB people in Spain at different times. You have mentioned this before and it fits the picture I have. I would be glad of a reference to the later BB brachycephalic types (whom I assume to be arrivals from north of the Alps after the power switch.) Rich pointed out a reference to one at Sion after said switch. Certainly some of the evidence such as the early dates for the actual pots in Iberia, a general spread west involving a Neolithic west Med. phenotype, the fact that several of the classic developed bell beaker culture elements only developed later in west central Europe, the fact that the early beaker spread east from Iberia was not much more than a west Med. culture, the fact that several non-IE languages exist in the early beaker west Med. zone, the evidence of Sion, the new paper suggesting an injection of northern European DNA into Iberia c. 2000BC (give or take some centuries) and the fact that this developed culture then spread widely including back to Iberia all are compatible with this kind of hypothesis. Maybe not exactly how Sangmeister saw it but something along those lines. The developed beaker culture is some sort of new entity caused by interaction of beaker influences with central Europeans. The exact location is a bit vague but it had to be somewhere where early beaker elements bordered other cultures or had some sort of interense contact (I imagine intermarriage may have been involved). What we need is a map of bell beaker at the end of its eary spread up to c. 2600BC and a map of the contemporary cultures in contact wih it at that point in time. The reason that corded ware or single grave culture is usually seen as the other element is simply because it was a massive block that occupied so much of temperate Europe around 2600BC but there were several other cultures and it could have even been a three culture hybrid. Sion was an early beaker site at one point and shows population continuity from pre-beaker times. I wonder if this is correct in that French archaeologists see the early beaker as a complete cultural rupture on the Med. coast and a substatial migration from Iberia. If the migration from Iberia was essentially of the same Neolithic stock as was already present throught southern Europee then could they really tell if there was a migration or not in the beaker period? Do you have a link or paper on the Iberian perspective that discusses the evidence of the 2 waves? Even if it is in Spanish I can usually work out what its saying (I once bought a book on the ancient Cantabri is Spanish and did manage to read it although it did take some time). Though, with good reason. Otzi, and by extension Sardinians, are probably the neolithic types who colonized Iberia. And the paper is, immediately, about understanding the demographics of Iberia. This wouldn't affect my analysis since I assumed that brana and the gotlanders were equadistant to non meso European descended folks. This looks like good thinking. After I made my last post I thought about the argument I was trying to make and now I think its pretty silly. Actually it was ridiculous! I still think that otzi being closer to brana than the gotlanders, suggests that "atlanto-med" has some southern meso European, but that is where ill stop. 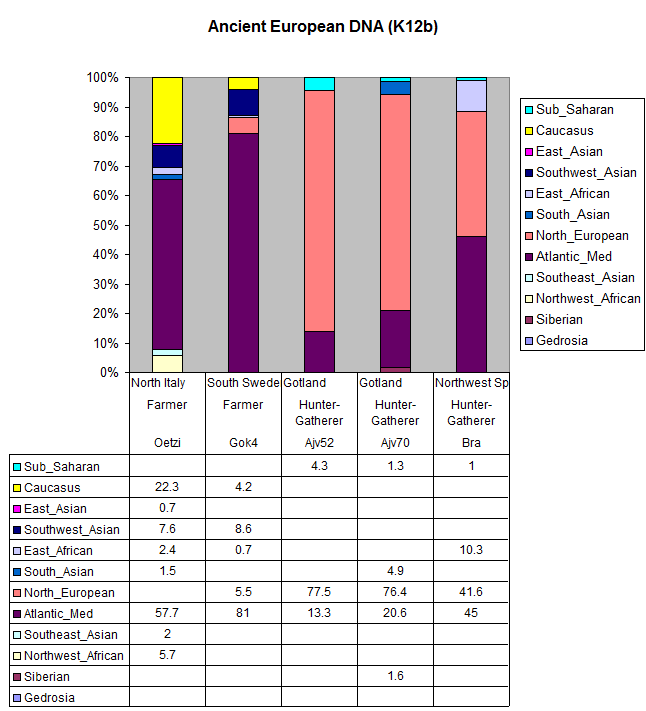 The stuff I said before is way way too nuanced for admixture runs. And it's definitely obvious that, as you point out, the "atlanto-med" component does not imply the same amount of meso built into it for each group. So it is something assumed more than explicitally exposed. When chronology is discussed usually only regional series are compared. I was looking again at RR's combined beaker and U152 map in and around Italy and it is interesting that although it looks like a good fit in north Italy, it is not so in Sardinia and the south in general. Sardinia actually has a significant beaker presence. Is this evidence that the initial out of Iberia beaker network expansion phase was not R1b/west asian autosomal component driven? Is this suggestive that areas which were in the early beaker west-Med beaker network c. 3000-2700BC should not be looked at in the same way as areas which recieved later full developed beaker? There was a relfux back to Iberia but it was not the same in distribution. I wonder if there were some areas that only recieved the beaker element in its initial west-east phase but not in the later phase of the developed beaker package of central Europe which also spread back torwards source. The overlap between the two phases was not complete. When you add that the location of Sardinian and Iberian may have shared a similar language, shared a similar strong early beaker phase but not shared a similar P312 pattern then it is tempting to speculate that there is a disconnect between early west-east beaker and P312 or IE languages. This of course is not an original idea. The idea that the IE developed beaker people were not the same people as the early Iberian and west Med. beaker people has been knocking about for a century in a number of forms. The skeletal evidence at Sion apparently supports the idea that the early beaker element that had reached as far as Sion were of Neolithic Med. stock while the later waves were different and included the famous craggy large chaps with plano-occipital (flattened rear - a better term than round headed) skulls. "The low frequency of haplogroup R-M269 in the central-eastern area of Sardinia and its prevalence in the north suggest that R-M269 arrived to the Sardinian coasts from the continent, possibly after the occurrence and diffusion of the autochthonous I-M26 subhaplogroup." Sardinia received mostly the "Iberian" BB package. The only two Sardinian R1b samples of any kind that I've been able to find in FTDNA projects are both from the BB heavy north west and they are both U152+L2-. U152* and one of its subclades (Z56) seems to be the more archaic U152 type with L2 possibly being linked to the Central European Brachycephalic type. In Sicily, R1b might be twice as common on the western half of the island than the eastern half (see Di Gaetano et al. 2009) and the west is the only area with heavy BB finds. Unlike the British Isles where Bell Beaker might be a starting point for R1b (although I find it hard to believe that the pre-BB builders of Stonehenge weren't at least M269), BB did not seem to drastically change the cultural or genetic makeup of the Italian Copper Age (Remedello, Rinaldone and Gaudo). Has anyone tackled a map of DF27 distribution yet? ... As for DF27, I don't think its distribution is as weird as everyone thinks...it can only be found in places where studies show P312(xU152,L21). IMO, the distribution of DF27 will be a pretty good match for the Iberian BB expansion. Do you think, then, that DF27 expanded from Portugal east across Spain and then across the Pyrenees into France? Or do you think DF27 expanded from Portugal by land through Iberia but more likely reached France and other points north via sea and river travel? I don't know how DF27 expanded. My default view is that DF27 would probably be similar to L21 in the Isles, but that probably means DF27 didn't expand out of Portugal originally. That is just a perception I have related to an assumption that DF27, L21 and U152 expanded outward from some point. I realize that is not fact, just an idea so I'm interested if you think DF27 came from some kind of already widely distributed P312* base versus expanding outward from some place like the Rhine or Rhone Valleys. We could do one but it would be based on FTDNA data so it'd probably be biased towards FTDNA markets and American immigration. I don't think we can find DF27* folks in the studies, can we? We'd have to make some kind of assumption that most P312* is DF27* which is not necessarily so. We could do one but it would be based on FTDNA data so it'd probably be biased towards FTDNA markers and American immigration. Here is a map of P312(xU152,L21) with an overlay of Palmeta Point finds. Since something like 95% of the Iberian 1KG samples that were originally classified as P312(xU152,L21) turned out to be DF27+, I have no reason to doubt the relationship between the two. I think the first DF27 probably sprang up somewhere near the mouth of the Rhone and then traveled westward towards the Pyrenees and then into Iberia. I don't think we can find DF27* folks in the studies, can we? Just for purposes of speculation, I'll suggest that DF27 originates (around 2100 BC?) east of the Rhine, and probably north of the Alps (unless it's so far east of the Rhine, it's not quite that far north). Anyway, to me, everything down to and including Z220 looks non-Iberian in origin; and maybe still non-Iberian as recently as 1500 BC. Somewhere along in that period (first half of the second millennium BC) a well differentiated DF27 is planted, flourishes, and spawns a few subclades in the Loire valley, and places to the south and west. And any present appearance of its Iberian success (which I am not disputing) is at least that recent -- if one perceives 3500 years as a short time. BTW in that book there is an article by X. Clop in which a analisis of BB pottery shows it was made of local clay, so we can have here a reverse of the adage "Pots are not people", pots didn´t travel, people did, and the idea of how to make those pots with them. @razyn, for someone who complains a lot about the lack of interest in DF27, you sure do like using belittling tones to describe the theories of others don't you? Let me clarify that DF27 does look Iberian and SW French. In fact, the only unbiased points of reference (1KG project, studies incl. M153 and SYR2627) we have tells us that, and not something that I imagined. So, DF27 does look Iberian, but I never said it originated there. Surely you must know there is a big difference. My theory stems from the movement of the Copper Age from the Western Alps towards the Pyrenees and from there into Iberia. So, aside from your personal desires, what do you attribute a migration out of the Rhine to? And please try not to use the FTDNA projects as a reference because all SNPs, including haplogroups E, J, etc. are all Palatine German and you can find every SNP known to man there. @razyn, for someone who complains a lot about the lack of interest in DF27, you sure do like using belittling tones to describe the theories of others don't you? No, I believe I complained specifically about the lack of interest in creating the tests at FTDNA for all the new SNPs under Z196 (before you came up with DF27's higher position, last fall) that you and a few others, to whom I am indebted, found in the 1KG project. And about a year after those tests were promised, they arrived; and I took them, and urged others to do so, and I'm happy enough with the pace of subsequent refinement of the ISOGG tree, etc. What I am belittling -- or at any rate disagreeing with, in certain public contexts -- is what I perceive as a tendency to assume the conclusion and then look for its proof, disregarding whatever doesn't support it. In this specific case, you have urged me (once again) "not to use the FTDNA projects as a reference." What is one supposed to use? We already had this discussion, and we disagree; I can still sleep at night, and I expect you can too. I do know that, and would have sworn you had said it originated there (in the context of a widely admired, mostly blue map); but if not, I apologize for the implication. Others have said it. For years, though they were formerly talking about Iberian R-P312* rather than DF27*. Anyway, the phylogeny under DF27 will ultimately look like what it looks like, whether the samples are from Palatine German descendants in the USA or Ligurian descendants in Mexico, or someone yet untested. And it starts looking Iberian just below Z220 on one branch, and SRY2627 on the other. (There's another DF27 branch independent of Z196 that may show up Iberian, but I think it's younger, not older.) As far as I've seen, the DF27 stuff from the 1KG project fits these basic parameters -- and inferred DF27* in the more recent paper(s) hasn't been tested to that fine a degree of resolution, so we really have no idea from that source. If we couldn't look at FTDNA project data, we'd have no idea, period. But I'm looking at it, because the data are right there in plain sight, and that's where people are actually testing these SNPs. Is the mini library accessible to all ? It is not open access, for copyright reasons. Access to it is strictly limited for the same reasons. Please forgive my mentioning it here, where there are some users. I must stop doing that. If you have a University account or subscription to journals such as Nature, whatever is in the mysterious and exclusive mini-library is probably accessible. My biggest beef is why education has such a extravagant price. No wonder why this world is a mess!!! Education should be free and accessible to everybody; not the privileged few. If you ever come across Khan Academy, this is what needs to happen for all branches of science. No hording of information, but the sharing of knowledge. Sorry for the rant. I'll get my hat. Anyone who needs me will find me over in Athrogenica.